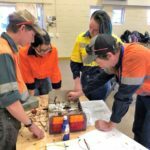 Students at Wadja Wadja High School will learn what it takes to become a tradie today when they work alongside employees from the Coronado Curragh mine. 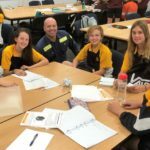 The students will take part in a Toolkit for School Kids run by the Queensland Minerals and Energy Academy (QMEA). Coronado Curragh’s Emma Pollard said she was impressed with Wadja Wadja students’ enthusiasm for learning and Curragh staff looked forward to working with them again. “It’s a great way for students to learn about the career options available to them in trades and to learn how to get on the pathway to training and eventually a job, hopefully in our sector,” she said. “Having good skills with your hands is critical for many of our site-based trade roles and this experience provides some insights into what is needed. “Our students very much benefit from this type of experiential learning,” said Wadja Wadja High School’s Principal Andrew Evetts. “The students always talk about these activities for weeks after and they leave a long-term impression,” he said.